Oh the dill pickle. 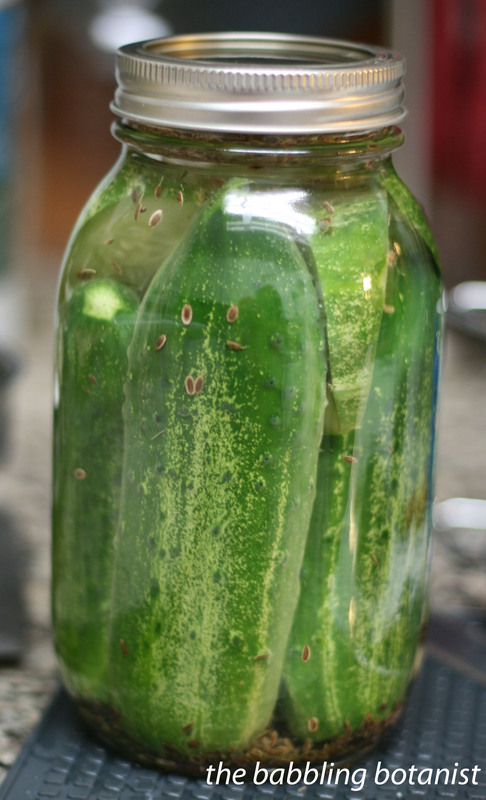 The pickled cucumber is a special enough pickle that we simply call it a pickle. A pickled beet is a pickled beet, and a carrot that has been pickled is a pickled carrot, but a pickled cucumber, well that is just a pickle. Where was I going with this? Oh now I’m in a pickle. Anyways, is there anything better than biting into a pickle and hearing that crunch… aww this is a good one. On the flip side, isn’t it awful to bite into a pickle and find that it’s completely soft? So dissatisfying. I actually was never a huge fan of pickles until recently, but I can remember my grandpa always having a pickle on the side of a grilled cheese sandwich. I wish he was here today to judge in this pickle experiment I am about to tell you about. So how do you achieve the perfect pickle? Well, there are a few options I sought to test. One way to make pickles is through the process of fermentation, but this type of pickling will be addressed in a later post. The reason for that is because they produce a different product in many ways than making a quick pickle, so for this experiment I wanted to test two of the most common methods of crisping quick pickles – those that are placed in vinegar and processed immediately. Pickle crisp is a product put out by ball, but I’m sure other brands sell it as well. All it contains is calcium chloride, which is supposed to help maintain the firmness of pickles. You simply add a very small amount to each jar when you are packing them. Quick, easy, and just calcium chloride. Generally, when we process foods in jars to make them shelf stable, we do so in a boiling water bath canner, with the water at a full rolling boil (or of course in a pressure canner for low acid foods). Quick pickles of all types are traditionally made this way, and most canning book instructions will tell you to do it that way. However, when some extension service or food science folks somewhere (I forget the exact details of Janice’s anecdote) started digging deeper into how pickles are processed industrially, they discovered something very interesting. Pickles were being processed at lower temperatures, which can help maintain that crispy, crunchy texture that we all love about pickles. So, it was time for some science! Can we safely process at lower temperatures at home? Yes, it turns out we can. Maintaining the temperature between 180-185F for 30 minutes is a safe way to process certain tested recipes, all of which can be found in PNW 355. 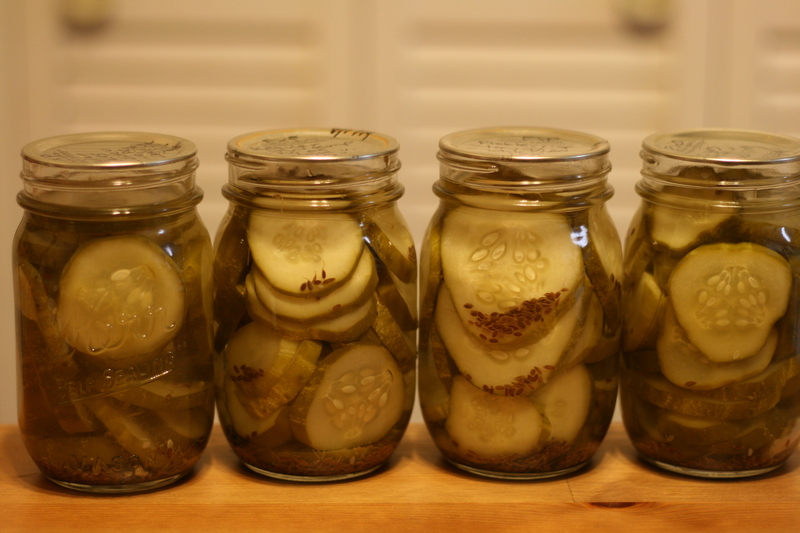 To process your pickles at low temperatures, there are a few things that are a bit different. First, you pack them as you would normally, then place the jars in a half filled canner with warm water (120-140F). Then add hot water, until an inch above the jars, and heat the canner to 180F and start the timer. Try not to exceed 185F or it sort of defeats the purpose of low temperature pasteurization. The frustrating part can be that you have to watch it a bit more closely than when you are processing in boiling water, because you don’t want to drop below 180F or go above 185F. Unless you have a sweet electric canner with set temperatures, like the one that OSU extension has for classes (which by the way is impossible to find on sale anywhere), you need a thermometer, like this long one to check the temperature, or this sweet one with an alarm that goes off when you reach the set temperature. Then all you do is process them for 30 minutes, removing them right at the end of 30 minutes will no additional wait time like in boiling water. OK, so on to the making of the pickles. These are the ingredients I used in every jar. Then my experiment consisted of processing some of the jars using the traditional boiling water method, and some using low temperature pasteurization. Then some of those jars had pickle crisp and some did not. Finally, I made a jar also of whole pickles to see if they stay crisper than slices. Make the brine by combining the water, salt and vinegar in a saucepan and bringing it to a boil to dissolve the salt. I like to either do this after I see how many jars I filled, or just make a bit extra since I always seem to need more. Place 2 cloves of garlic, 2 heads of dill, 4 or so peppercorns and the red pepper flakes in each jar. To prepare your cucumbers, cut a little slice off the blossom end. This is important for firmness as well, as there is an enzyme in the blossom end that can soften the pickles. Cut them how you like, or leave them whole. Spears, coins, slicers, you decide. I also am doing a comparison with ones that were processed whole versus sliced to see if that makes a difference for crispness. Pack the cucumbers into the jars. Cover with brine, leaving a half inch head space. Remove air bubbles with a plastic or wooden utensil and adjust head space as needed. If adding calcium chloride, add 1/8 tsp per pint jar, or 1/4 tsp per quart jar. Wipe the rims, apply the lids and bands, and process either for 10 minutes (pints) or 15 minutes (quarts) in a boiling water bath, or for 30 minutes using low temperature pasteurization as described above. After removing the jars from the canner, let them cool 12-24 hours, remove bands, wipe them down, and store for a few weeks before eating them. I took them to canning class a few weeks later and had the students do a blind taste test – read on for the results! Which pickle was the ultimate pickle!? Have you ever tried low temperature pasteurization? Do you have a different secret to super cripsy pickles? Let us know! Or if you’ve had trouble getting your pickles to stay crispy I’d love to hear stories if any one else wants to replicate this experiment. Make some pickles, have a tasting party in a few weeks, and let us know what your friends liked best. Happy pickling! September update – experiment results! So, I know you’ve been on the edge of your seat wondering what the results of this experiment would show, so here they are. As a reminder, what I did was 5 different pickles. The pickles were all the same spices and brine, it was the processing that differed. The first 4 were all canned as slices, the fifth was canned whole and sliced for the taste test so people couldn’t tell which one was canned whole. I randomly assigned them to a number 1 though 5 for people to taste test. The 180 degree processing needs to be done for 30 minutes, and right now I think they only have said it’s safe for cucumber pickles. Tomatoes are a pretty high acid food, so you won’t have any issues with the acidity if you pickled them, but that processing time may not have been enough to kill all yeasts or molds in the product. I’m curious about the 1:1 vinegar/water ratio. I’ve never seen that in a pickle brine, though I’m just an occasional pickler. Are the pickles more sour than normal? I’m not sure what “normal” would be, since I’ve always done 1:1, but yes you’d probably notice a difference if you are used to a lower ratio. No less than 1:1 is what is recommended for safe quick pickles. Cider vinegar is less sour, so I like to use that rather than white in many of my pickles, or cut the sour with a bit of sugar if you don’t like it. I’ve recently become interested in pickling. I’ve seen recipes that call for grape leaves in the jar to enhance crispness. The tannins in the leaves are supposedly the reason. I’ve also seen that some pickling spice contains bay leaves which also contain tannins. If you ever decide to continue your research, I would be interested in whether these do, in fact, work and whether the result is comparable to adding calcium chloride. Thanks for your research. Thanks for your comment. My understanding is that the grape leaves will increase chripness by counteracting the softening enzyme that is found in the blossom end of the cucumber. Therefore, if you cut the blossom ends off you shouldn’t have softening from that enzyme, so it shouldn’t make a difference. However, I can certainly test this theory this year! I try to be as green, organic and natural as I can so therefore using Pickle Crisp and most Ball products are out. However, I did just successfully do a 64oz jar of dills that are crisp and wonderful just like Bubbies. I used Holm Oak leaves. Last year I tried just cutting the blossom ends off and it didn’t work. But this latest batch is awesome. Crisp. Flavorful. Competitive with commercial brands. The low temp method calls for 30 minutes at 180 – 185 degrees. Does this apply to both pints and quarts, or are there shorter processing times for pints? Low temp calls for 180 – 185 degrees for 30 min. Can you process pints for less time? Is this method safe for pickled jalapeño rings? And, what do you make of this? In the early editions of the method the experts said you could use this method for things other than just cucumbers, but last year they revised it to say cucumbers only. I would think it would work, but I guess they changed their recommendations because they were finding spoilage in some things other than cucumbers. Here’s the newer version of PNW 355. You can see in this edition it doesn’t list it for the pickled peppers. Did you get a chance to look at the Chefsteps link that I attached. They use a sous vide method which involves processing at 140F for 2 1/2 hours. I have a Joule precision circulator so I tried their method and the resultant pickles were very crisp. Altough I’m super late to the party, I wanted to thank you so much for posting this, and saving me the time of doing the same experiment. Fantastic and really interesting information. I’m wondering if my Anova Sous Vide could maintain the temp in my big ole canner. If so, that’d be perfect. I’ll try it with jars filled with water, and double check with a thermapen.